Cocoa Puff, was a dwarf rabbit, purchased at That Pet Place in Lancaster Pa., where grandparents bought the bunny then about 2 months old at the time, for a 7 year old boy for his Easter present. The parents of this boy did not know or agree to this present at the time. A life long lesson: don’t buy animals for people’s birthdays or any other occasion. In summary, the child did not want to play or interact with this rabbit, got bored and the mother ended up caring for this young rabbit. Late in August of 2007, the mother asked Kathryn if she would take the bunny, as he was not getting any attention at all. This lady’s husband dropped off the bunny in a box,right by the dumpster at a school in Temple, Pa. That caused a lot of conversation about the mysterious box near the trash can. Kathryn went to the school that day and retrieved the box with the bunny. Kathryn agreed to give Cocoa Puff a new forever home where this young female rabbit would then be part of the therapeutic ranch, The Gress Mountain Ranch. Ben, told Kathryn, that “I can get you some Cocoa Puff” in a box, but soon opened his big heart as he could see his wife, wanted to give this bunny another chance in life. Cocoa Puff, did not like to be held, and would run around, the greenhouse, at top speed, and then to every one’s amazement, would dig huge holes in the soil, and uproot some plants in their natural environment. Cocoa Puff, did not like Cotton, the other rabbit, and would stand on her hind legs and scratch and tried to bite Cotton. The two rabbits were not together, because of this. However, after Cotton, passed over the rainbow bridge…Smokey, the new cat, befriended Cocoa Puff, and the two , cat and bunny would play, in the greenhouse. 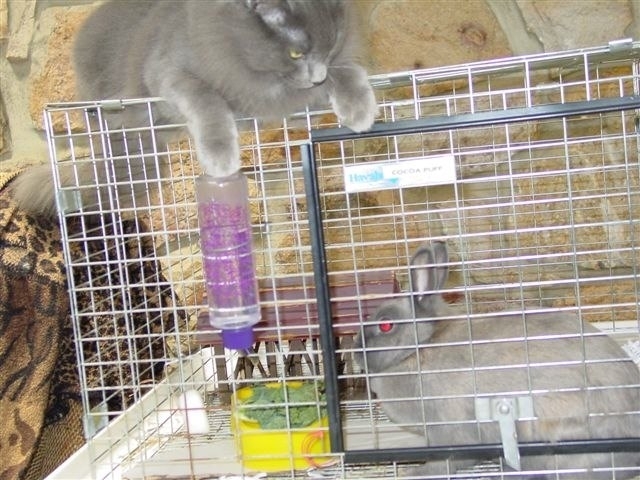 Smokey, many times would sit on top of the bunny’s cage and relax up top! But, suddenly, for no apparent reason, Cocoa Puff, went off her food, and Kathryn, said,”Cocoa Puff, I’d better take you to the vet.” But shortly after that time, this dwarf bunny who came into our lives so quickly and so young, died in a what felt like a moment. 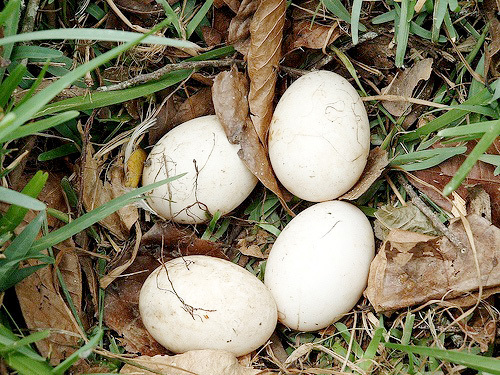 Sudden death is very hard,and we have many questions, but no answers. As the agreement with the purchase of this bunny stated: there are no guarantees. Cocoa Puff lived only one year and Smokey knew she was ill. He smelled her in the cage and then only returned to it once she was gone. 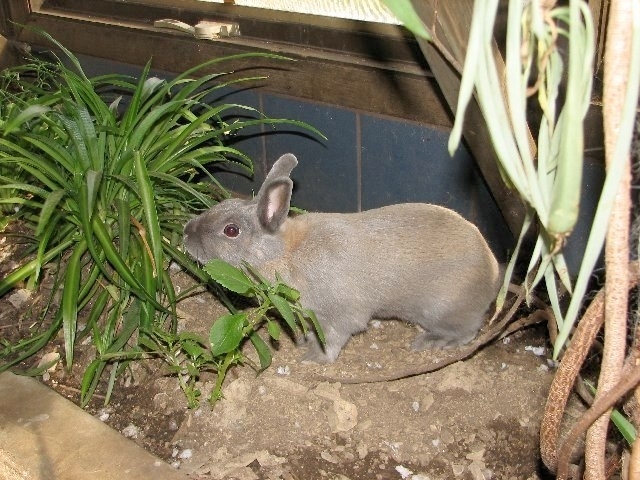 Smokey still searches the greenhouse area for his playmate….Cocoa Puff, sleep well…….and hop over to the bunny heaven.